Control your style with PlatinumX Gel. This lightweight formula for platinum, blonde, gray and silver hair provides hold and control with long-lasting style memory. Rice proteins help strengthen damaged hair, delivering a thicker, more luxurious look. What is it? 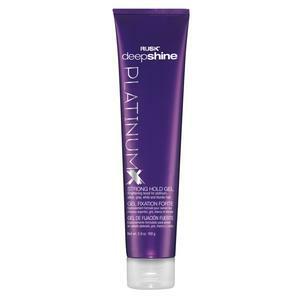 Rusk PlatinumX Gel is a lightweight, long-lasting memory formula that provides firm hold and control. What does it do? Infuses long-lasting memory, provides hold and control, with a thicker, luxurious look. Formulated with Violet 2 to help neutralize unwanted yellow, boost brightness, eliminate brassiness. How do you use it? Apply to clean, towel-dried hair. Comb through to distribute evenly. Style as desired.